Click here to view poles available from our online store. Travel was by canoes over water during traditional times on the Northwest Coast. Villages were located along rivers or by the ocean. Totem poles faced the water and travellers could read them. Poles told the stories of the people there. Native People travelled and traded widely. Trade was very important. Even during hostilities, temporary truces for trade were honoured. People intermarried with distant communities. Marriages were alliances that brought access to goods from other areas. Poles were like address markers or directories. On the coast there are many distinct cultures, but there’s also a common culture. 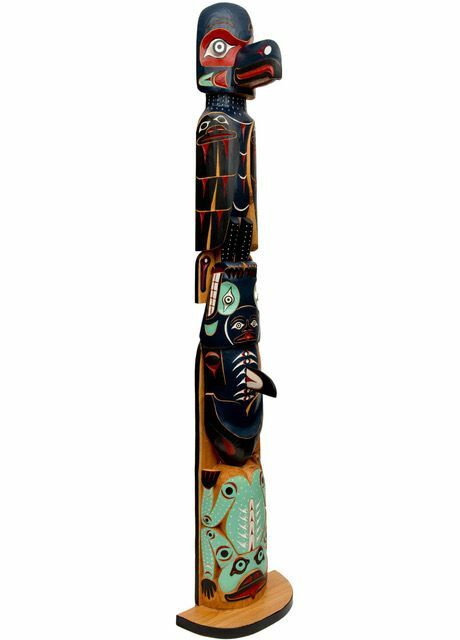 Northern Totem Poles are like documents recording family histories, genealogies and registering property in an oral culture. Cultural property is intertwined with physical. House Chiefs possess Names to which are attached crests, songs, dances, and stories, as well as territories and resources. 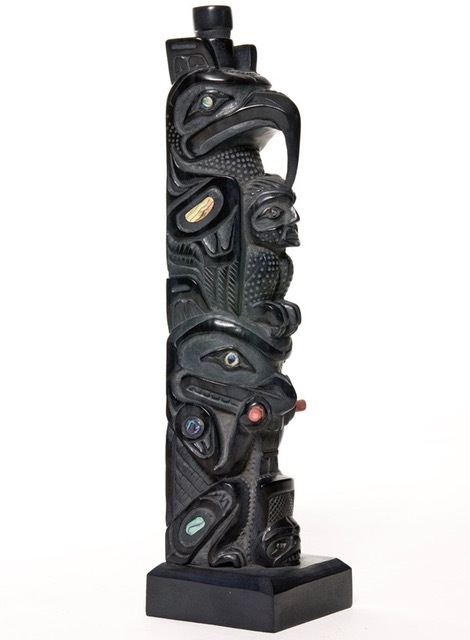 Click for information about this argillite pole. A pole raising is often connected to the death of a chief and the transfer of his or her name and possessions to the successor in a potlatch. Speeches are made, stories told, songs and dances performed. and supernatural experiences re-enacted. Witnesses are paid to memorize all they’ve seen and heard. Much wealth is redistributed in gifts. This information is summarized on the pole. 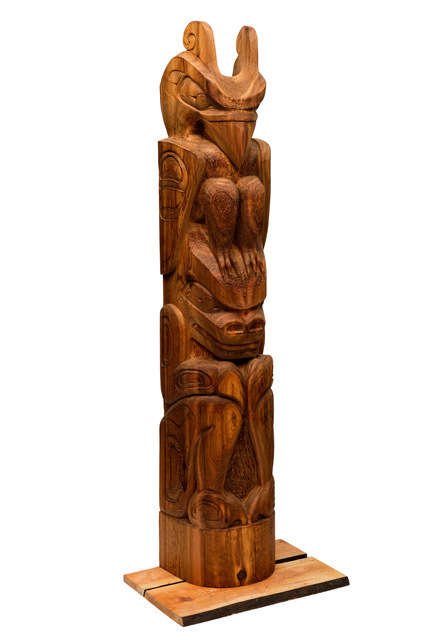 There are other types of poles such as the welcome figure with outstretched arms. Carved pairs of house posts support beams in traditional plank longhouses. Portal poles are in the centre of the front of the house and have a doorway through the pole which is used for ceremonies. Mortuary poles have a body or ashes in a box on top. Shame poles are raised to commemorate an offence or an unpaid debt. 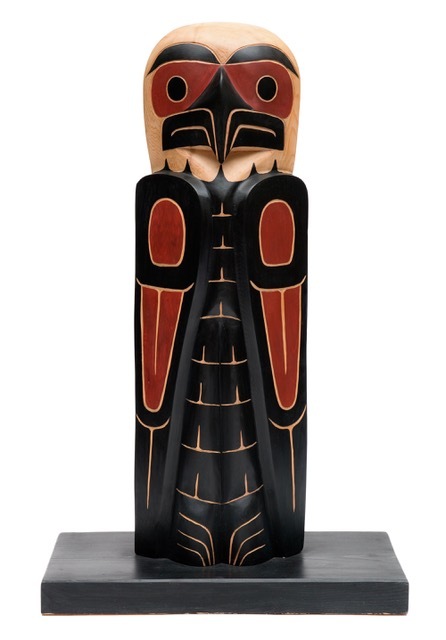 Click to view model totem poles. Modern commercial poles and model poles are made for sale as art objects that show admiration and respect for the original cultures and peoples of this land.